Construct more then one nesting area. Substrate is likely one of the most influential characteristics in turtle nesting. Along with site location, substrate influences both nest moisture and temperature. Turtles and their eggs have a range of temperature and moisture tolerance, outside which they experience abnormalities or mortality. Their nests require a balance between a substrate that is too wet and a substrate that is too dry. Eggs that sit in water or saturated substrate will drown or develop mold. However, substrates that are too dry will not supply the eggs with enough water. The substrate must also allow air circulation and be loose enough for the female to dig the nest and for hatchlings to dig their way out. While turtles seem to prefer nesting sites with moist, well-drained soils, they may select sites with different substrates depending on climatic conditions of the year. It is important to provide variation in your nesting sites and offer nesting turtles many options. Try different substrates, mixtures of substrates and different locations. We know that turtles have opportunistically nested in substrates created for other purposes such ploughed farm fields, lawns and flower beds to coal slag, piles of sand, woodchips and roadside shoulders! Constructing more than one nesting area is important in your design as they will provide micro-climate variation, reduce the likelihood that vegetation will cover the site and reduce predator saturation of nesting sites. The type and size of the substrate particles will affect air space, temperature and moisture level. For soil, there are three size fractions: sand, silt and clay. Loam is some combination of all three. Suggested artificial turtle nest substrates: Gravel, sand, sandy loam (better water retention than fine sand), disturbed soil, woodchips, dark/light substrate colours (dark will absorb light and provide more warmth) and replicas of gravel road margins. Crushed rock composed of hard fragments produced from rock formations or boulders, or a mixture of crushed gravel, sand and fines composed of hard particles produced from naturally formed deposits, or crushed slag produced from iron blast furnace or nickel slag. May also consist of a blend of natural aggregates, reclaimed Portland cement concrete and reclaimed asphalt pavement material. sieves are vibrated for a period of time and the particles sort through the sieves. The amount of substrate retained on each sieve is measured and converted into a percentage of the total sample. While open, exposed sites are preferred, some low ground vegetation may to help decrease predation of hatchlings. 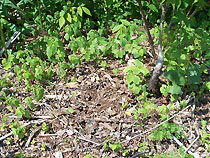 However, you will have to keep the vegetation from becoming too dense or too close to the nest site - active vegetation maintenance may be necessary. Landscape filter cloth, buried well below nesting depth (12") can be placed to prevent vegetation from establishing at the nest site. 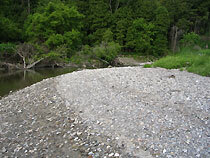 The presence of vegetation will also help stabilize substrates and provide erosion control. In natural systems, floods and erosion provide an ongoing supply of exposed soils available across the landscape as older, or more stable, sites become more vegetated. It may be necessary to protect nests with a wire predator exclosures that cover the nest and extend into the ground around the nesting area. Wire mesh must be large enough (2" x 3") to a low hatchlings to pass though after they emerge from the ground. If necessary, predator guards may be removed 14 days fter egg laying as most nest predation occurs in the week After egg laying. Unfortunately, there is not a lot of detailed scientific data on the specifics of turtle nesting sites. 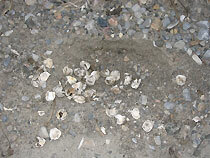 It is suggested that you provide variation in your nesting sites and offer nesting turtles a mosaic of options. If you don't know where to start, use data loggers and collect information (temperature, moisture, canopy cover, soil properties) of known nesting sites and try to replicate them. The cost of implementing an artificial turtle nest project will vary according to the project design. Materials (i.e., substrate, vegetation, filter cloth), equipment (i.e., backhoe, temperature/moisture analysis) and manpower should be factored into your budget. Pea gravel	 $35 per cu.yd. Granular 'A' Gravel $32 per cu.yd. Landscape soil (topsoil/sand)	 $20 per cu.yd. Eggs should only be moved to a nearby location and left in the wild. Carefully lift each egg without rotating, rolling or shaking it. Always keep the top of the egg oriented to the top. Place in an old egg tray or nestle into sand/soil so that the eggs do not roll. Transport to a nearby nest area that is a similar distance from the water body, has a similar orientation to the sun, and a similar substrate material and moisture. Dig a hole to the same depth as the original nest (~8-10") with a wider bottom than the top (i.e. flask shaped). Carefully place eggs into hole with the eggs 'top' upwards in the nest. It may be necessary to cover the nest with a wire mesh predator guard. 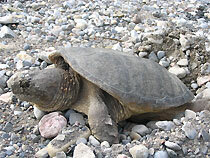 Most Ontario turtle eggs will hatch in 60-90 days, although painted turtles often hatch and overwinter in their nest, emerging the following spring.